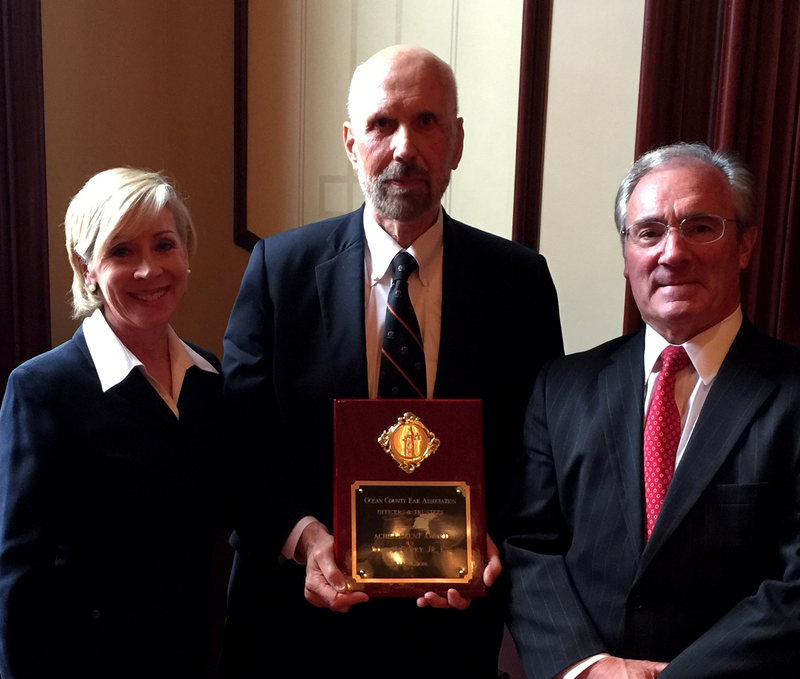 Honorable Vincent Grasso, retired, former Assignment Judge, presented the Achievement Award to James J. Curry, Jr., Attorney at Law, on behalf of the Ocean County Bar Association during Law Day on May 3, 2016. Honorable Marlene Lynch Ford presided over the day while current and retired Judges, Senators and Members of the Assembly were in attendance. Mr. Curry was recognized for the care and consideration given to each client while in the pursuit of justice. James J. Curry, Jr., areas of expertise include personal injury, elder law, probate and trusts and estates. Mr. Curry is known for his verdicts and settlements as well as his educational presentations at New York University School of Law and National Business Institute’s seminars. With an office located in Toms River, Mr. Curry serves clients in and around Toms River, Seaside Heights, Beachwood, Point Pleasant Beach, Normandy Beach, Lakewood, Lakehurst, Manchester Township, Bayville, Ocean Gate, Island Heights, Brick, Forked River, Pine Beach, Lanoka Harbor, Lavallette, Mantoloking and Ocean County.